Earlier this year, I started a fantastic partnership with my friends at California-based Frieda’s Specialty Produce. Each month, they send me an item from their huge selection of produce -- like peppers, cherimoya, vanilla beans, or Meyer lemons. I share my thoughts and also feature a feature a recipe incorporating the product. I always look forward to receiving their package each month, because their quality is great -- and the foods are so much fun to work with! I also love having the chance to try new-to-me products like exotic and delicious cherimoyas. This month, Frieda’s sent me a fabulous Holiday Gourmet Box that’s chock-full of all kinds of fun goodies, including: dried cranberries, shallots, mulling spices, purple sweet potatoes, and crepes. 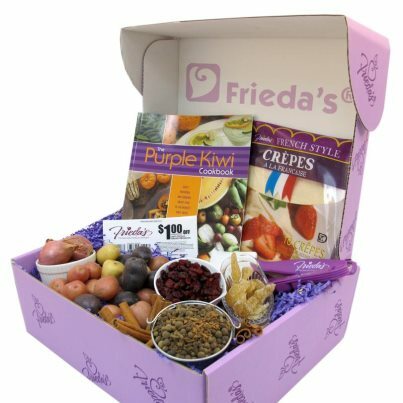 The box also contained an adjustable measuring spoon, canvas tote, and spatula…all in Frieda’s signature purple color and featuring their logo. I decided to use the French-style crepes to make a savory dish that’s equally good for breakfast, brunch, or even a light dinner. I love crepes, but I haven’t had consistent success making them from scratch. Frieda’s crepes are fresh-made and come refrigerated and ready to be filled with sweet or savory fillings.. They’re a real time saver too! I wanted to do something a bit different, so I tweaked a recipe I found online and have dubbed Cheesy Sausage-Mushroom Crepes. The savory filling is made with sage-infused bulk pork sausage, cream cheese, cheddar, and a few aromatic veggies and herbs. The filling comes together in about 15 minutes, and the crepes are rolled up and ready for a quick trip to the onion to heat through. While the crepes bake, you have a pocket of time to whip up a simple creamy sauce to spoon on top of each serving. Step 1: Preheat oven to 350. Add the following ingredients to a large non-stick skillet over med-high heat: 1 lb. bulk pork sausage (I used Jimmy Dean sage sausage), 2 chopped shallots, ½ cup diced cremini mushrooms, and 2 cloves grated garlic. Cook until the sausage is browned, about 8 minutes. Drain the grease from the pan and add the following ingredients: 4 ounces diced cream cheese, 1 cup shredded cheddar cheese (I used a three-cheddar blend), and 1 tsp. fresh thyme leaves. Stir well to combine…until the cheese are evenly incorporated into the sausage. Reduce heat to low to keep the mixture warm. Step 2: Lay one crepe on a plate and add 3 tbs. of filling in a strip on the edge of the crepe nearest you. Carefully roll up and place seam side down in a non-stick 9x13 pan. Continue until you have used all the filling – you should get 7-8 crepes. Cover the pan with foil and bake until heated through – about 15 minutes. While the crepes cook, make the sauce. Step 3: Add the following ingredients to a non-stick saucepan over medium heat: 8 ounces light sour cream, 4 tbs. salted butter, cracked pepper to taste, and 1 tbs. dried parsley. Stir continuously until the butter melts and a creamy sauce is made. Reduce heat to low to keep warm until you’re ready to assemble the crepes. To serve, carefully use a spatula to place two crepes on a plate. Top with some of the sauce, additional shredded cheddar, and sliced green onions. These crepes are amazingly good…they’re creamy and so flavorful! The crepes themselves are thin, light, and slightly sweet…which actually worked well with the savory filling! I loved the creamy topping and cheese on top, and the shallot-mushroom combo gave everything a nice earthy background flavor. These crepes are pretty much a one-dish meal. I served them with a simple fruit salad, but scrambled eggs would be another great option! As a bonus, this dish can be assembled ahead of time and frozen until you’re ready to bake. Simply thaw the dish on the counter for 30 minutes, then bake until heated through and the filling is bubbly. You could easily whip up a pan of these crepes now and freeze them to make on Christmas morning while you unwrap presents. As a quick side note: his filling is so good that you could easily double the amount of cream cheese and have an amazing warm dip on your hands! In the spirit of the holiday season, Frieda’s is giving one of my readers one of these fabulous Holiday Gift Boxes! Since we’re all busy these last few days before Christmas, I’m going to make this really easy. To enter, simply leave me a comment below, along with your e-mail address…tell me your favorite thing about the holidays and how you would use the package of crepes in the gift box to create a special treat. I’ll accept entries through this Sunday, December 23rd. I’ll pick a winner on Christmas Eve and notify them via e-mail that day. The package will be shipped out right after the holiday break. My favorite thing about the holidays is spending time with my family! I'd love to use the crepes to make a sweet crepe...we like to fill ours with cream and top them with strawberry jam! I would normally say we would fill them with strawberry fruit spread and smoother them with whipped cream but your savory recipe looks so good! Audrey has learned to love strawberry crepes from her dad who makes them very well. I wish he had more time to make them because mine never come out well! looks yum! i don't know why i thought you didnt like mushrooms....it's olives isnt it? I love exchanging gifts with my friends (stealing!). I'd make a dessert crepe, nutella with raspberries, maybe! Facebook email is best bet, should I be lucky! I love spending family time together at the holidays. I'd love to make some dessert crepes....maybe with nutella! My favorite part of the holidays is spending time with friends and family and giving gifts to others. I would use the crepes when I have friends over to celebrate and make some sweet and savory crepes. Love the fillings of grilled vegetables and hummus, or for sweet a strawberry and chocolate crepe, yum! My favorite thing to do during the holidays is to give small treats to as many people as I can afford. This years treats include Carmel and chocolate dipped Granny Smith Apples. The Holiday Gift Box looks great. I would make 2 types of Ricotta Crepes. For Dinner, I would stuff the crepes with Ricotta, Mozzarella, and diced fresh parsley and top with marinara sauce. For Desert, a Cannoli Style Crepe with creamed Ricotta Cheese, Powdered Sugar & mini chocolate chips. The Frieda's Crepes would save alot of time. My favorite part of Christmas is spending time with love ones and simply getting a chance to relax from work. If I win this will be my first time making crepes, so I would probably make sweet crepes with my nutella! My favorite part about the holidays is spending quality time with family. As for the crepe, I'm torn between a savory one with mushrooms or a sweet crepe with strawberries. I love my Christmas tree! That is my favorite part of the holidays! I would make something sweet with the crepes. I have some homemade peach jam that would be lovely with them! I love spending time with my family and eating all the awesome food we create. I have never had a savory crepe, I would love to try my hand at that!